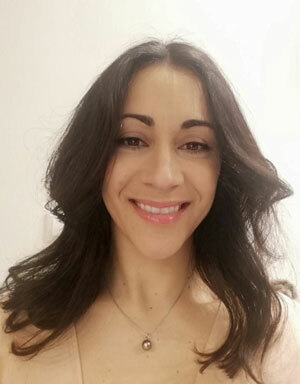 Kristen is currently studying Product Design Engineering at London Southbank University, having moved over to the UK from France to be able to further her education. Kirsten’s design was inspired by a close friend who is paralyzed from the waist down as a result of a motorbike accident. Kristen credits many of her ideas as being “crazy” and often works backwards to find a way to make them work. She tries to come up with innovative designs to help people who may not be in a position to help themselves, such as homeless people or those suffering from a disability. In the future, Kristen hopes that she can position herself in a career where she can encourage other young girls or women to also pursue careers in engineering and design. Kristen has come up with a wheelchair solution that helps to both sanitise and improve the function of the pushing mechanism on a standard wheelchair. The aim is that the chair will be easier to maneuver for users. 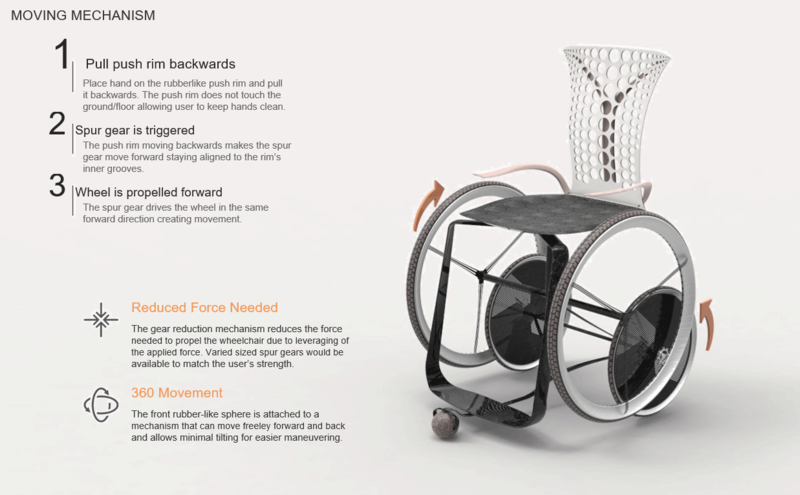 Moveo is an innovative wheelchair that was designed specifically for people with spinal cord injuries. However, it can be used by any wheelchair user 8 years of age and older. I chose to create something for this particular disability as the concept was originally designed for the Bolt Burdon Kemp 2018 Design Challenge geared towards people with spinal cord injuries, of which I won 1st place. In addition, a close friend of mine has this disability and I have observed the hidden challenges this group of people face on a daily basis. My idea initially came from the frustration of observing how unsanitary and non-functional the pushing mechanism is on traditional wheelchairs – the hand must touch the wheel when pushing, leading to contamination of whatever the wheel has picked up from the ground or the floor. In addition, this disability brings along poor dexterity meaning users have a very hard time pushing the rim – Moveo solves this by providing a wider pushing surface made of a rubber-like material that is easy to grip. Moveo’s main attribute is the deferred pushing mechanism that runs through a spur gear allowing for a physical separation of the push rim and wheel. In addition to providing a more sanitary and effective pushing mechanism, the gear reduction process reduces the force needed to propel the wheelchair due leveraging of the applied force. Through prototyping, a set of spur gears could be developed to meet the needs of users with varied strength capabilities. This concept is different from any other product, as this spur gear derived pushing mechanism (where users are still using a push rim) does not exist in the wheelchair market and answers a great need of separating the push rim from the wheel. Prototyping would have to begin with establishing whether this spur gear mechanism works in a wheelchair context, designing a spur gear that reduces force required without making it too fast, and fabricating the frame to be as functional as possible while keeping the design clean and minimal. Using plywood for the seat and armrests, 3D printing for the frame and spur gears, and existing bicycle wheels for the wheels and push rim, I would estimate a proof of principle rig could be constructed for approximately £1000. An improved iteration, which I hope would be a prototype capable of real world testing (carbon fibre frame, PCM packs in the seat, Infinergy E-TPU on the wheels and push rim, plastic/metal 3D printed rims, and formed plywood or carbon fibre for the seat and armrest) could be constructed with the remaining £4000.